and left cornucopiae. A crescent in right field above patera. Crescent over K in left field, G over P in right field. ALE in Exergue. 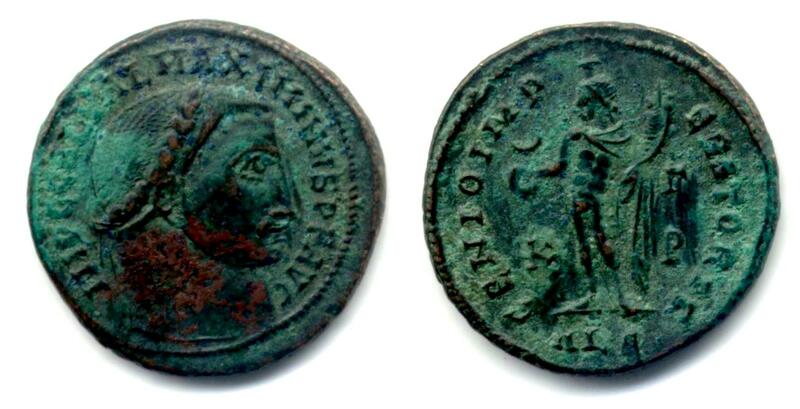 Minted at officina Gamma in Alexandria (Egypt) in 311 A.D.
Sutherland, C.H.V., "Roman Imperial Coinage", Volume 6 (RIC), Alexandria, p682, nr 139b. hinterlassenen Sammlung und Aufzeichnung des Herrn Paul Gerin" (Voetter-Gerin), Alexandria, Maximinus Daia, p19, #22. Van Meter, D., "Handbook of Roman Imperial Coins", p283, nr 13.